The greatest villain of all comes out of the past to threaten Batman, Bruce Wayne and all of Gotham City in Batman Beyond: Return of the Joker, the first feature-length Batman Beyond movie. The sleeker, deadlier and seemingly immortal Clown Prince of Crime is back with his own unique brand of havoc and mayhem. While trying to uncover the Joker's secrets, the new Batman, Terry McGinnis, discovers the greatest mystery in the life of the original Caped Crusader: What happened the night he fought the Joker for the last time. When Bruce Wayne is almost killed in one of the Joker's latest attacks, Batman vows to avenge his mentor and put the Joker to rest forever. 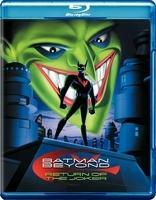 Get ready for heart-stomping action, awesome adventure and amazing revelations in Batman Beyond: Return of the Joker. Music video: Mephisto Odysey featuring Static X, "Crash"
In 1992, spearheaded by artist Bruce Timm and writer Paul Dini, Batman returned to television screens in an all new animated series. The show proved to be not only extremely popular, but of exceptional quality, reaching heights that few animated children's programs ever have. Where most cartoons tend to dumb down their stories and material, Timm, Dini, and the rest of the creative team went in the complete opposite direction, creating an animated program that respected its young audience and never talked down to them, weaving interesting, well written stories for all ages. A dark mixture of Art Deco design and classic comic book sensibilities, the show spawned an entire universe of spinoffs spanning well over a decade. One of these spinoffs was 'Batman Beyond.' Set several decades after the original Batman series, 'Batman Beyond' followed an aging Bruce Wayne as he gave up the cape and cowl and took on a new teenage protégé to train as his replacement. The series ran for three years, producing fifty two episodes of neon lit futuristic adventures. During the show's run a direct to video movie was made that served to help bridge the gap between the two series and reintroduce Batman's most iconic villain, the Joker. 'Batman Beyond: Return of the Joker' is a great example of Timm and Dini's unique take on the Batman mythos, and though not quite as successful as some of their other collaborations it does make for an entertaining watch. The story follows Bruce Wayne and the new Batman, seventeen year old Terry McGinnis, as the two struggle to deal with the mysterious reappearance of the long thought dead, Joker. Written by Dini from a story by Dini, Timm, and Glen Murakami, the plot here is fun, entertaining, and at times surprisingly disturbing and insightful. Dini and Timm have proven time and time again in the past that they know these characters inside and out, and this intimate understanding of what makes them tick and work on screen is apparent throughout. The Batman and Joker relationship is one of the most interesting aspects of the comics, pitting law and order against anarchy and chaos. Here, the writers put their own spin on things furthering this twisted dichotomy and expanding upon it in fresh and occasionally unsettling ways. Likewise, there are some interesting insights into the psychology of Bruce Wayne and the ramifications of his repeated enlisting of young teenagers as crime fighting companions. While the character development is well done, and the action is exciting, there are some problems with the story. Frequent shortcuts in the plotting take occasionally easy and convenient approaches. This is understandable given the intended younger audience, but sometimes developments feel a bit contrived, and several scenes drag with long exposition. Also, though the creators have done a great job of expanding upon the Batman mythology with an entirely new world of characters, Terry McGinnis and his companions never quite reach the same level of appeal and depth as the classic Batman staples. With this in mind, it shouldn’t be surprising that the most effective scene in the movie is a wonderfully staged and animated flashback sequence set during the original series' timeline. Still, the story as a whole is well done and the movie's dark revelations are intense and interesting. Bringing the story to life is an exceptional collection of vocal talents. To most who grew up in the nineties, Kevin Conroy is the definitive Batman. His deep, commanding voice is perfectly fit for the aging Caped Crusader. Like Conroy, Mark Hamill's interpretation of the Joker has become iconic. His twisted mixture of wacky impishness, and terrifying psychosis effortlessly cuts to the root of the maniacal Clown Prince of Crime. His laugh will echo in your mind long after the credits have rolled. There is a reason these two actors have been repeatedly asked back to voice these characters time and time again in various cartoons and videogames. They simply get it. Will Friedle is also great as the new Batman, providing a nice mixture of youthful energy and playfulness that clash wonderfully with Conroy's intense and brooding version of the original Dark Knight. Bolstering the impressive vocal talents is a simple, but effective animation style. Bruce Timm's slightly retro character designs are as wonderful as ever, and though the animation never quite reaches the same quality or production value as some of the more recent DC animation projects, it's still fairly appealing and fits the tone of the movie well. 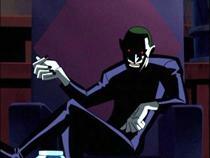 When first released in 2000, 'Batman Beyond: Return of the Joker' was met with quite a bit of controversy. There was some objection to the film's sometimes unsettling content and violence. Two cuts of the movie were made, a more family friendly, sanitized version, and the original PG-13 cut. The version provided here is the PG-13 variation. While I can understand the concern, and there are indeed elements that do push the envelope with dark content in children's programming, the choices are never gratuitous and always serve the story in a tasteful manner. While definitely more intense than your average episode of the series, I'm not really sure the PG-13 rating is truly warranted. In the end, 'Batman Beyond: Return of the Joker' is an entertaining, action packed adventure that holds a bit more depth than your average animated movie of this type. Though it doesn't quite reach the same level of sophistication that some previous and subsequent material from Timm and Dini have, it still bears the quality mark of their trademark creativity. Provided in a 1080p/AVC transfer in the 1.33:1 aspect ratio, 'Batman Beyond: Return of the Joker' has a very pleasing, clean look to it. The animation style itself is rather simple with an almost minimalist approach, so there isn't a lot of detail per say. That being said though, the picture is razor sharp and colors are wonderfully vibrant, popping off the screen throughout. Blacks are nice and deep, and contrast is excellent. The only real downside to the transfer is some occasional aliasing around the edges of objects and characters. Though not hard to spot, it's never distracting and is easily forgivable. Overall, the film looks very nice and the simple, but stylized animation looks great in motion. Though there are some minor artifacts, the bold colors and streamlined visuals outshine these slight technical issues, and compared to the included DVD copy, the Blu-ray is leaps and bounds ahead. Fans should be pleased. The film is presented with an English DTS-HD Master Audio 5.1 track, and a French, Spanish, German, and Swedish Dolby Digital 2.0 track with English SDH, German SDH, French, Spanish, and Swedish subtitles. Like the video, the audio here is very good. Dialogue is crisp and clean. Surround usage is frequent and natural, sending explosions, flying batarangs, and the Joker's devious laugh echoing from all sides. Dynamic range is solid but never quite reaches the same expanse of big budget live action films. Bass packs some power in the action sequences and balance between vocals, score, and effects is good. Overall, the track here is quite strong, providing an exciting and enveloping audio experience. Warner has provided a decent number of supplements, including a commentary with the filmmakers. Unfortunately, most of the features don't provide much in the way of substance, but might still be worth a look for fans. All extras are provided in standard definition and stereo sound with English, French, German, Spanish, and Swedish subtitle options unless noted otherwise. A standard DVD copy of the movie is also included. Commentary by the Filmmakers - Bruce Timm and Paul Dini are joined by director Curt Geda and producer Glen Murakami for this commentary. The track as a whole tends to waver on the banal side, but there are some interesting morsels of information. Some highlights include discussing the difficulties of working on the film while the series itself was still in production, conceptualizing the story, and brief mentions of some extra bits of disturbing footage that were excised even before any controversy started. The filmmakers bounce off each other well enough but Timm seems to lead the discussion and most of the talk is dedicated to pointing out who storyboarded what sequence. Still, fans of the film, and animation in general, might want to take a listen. Animatics (SD, 3 min) - This is a slideshow of black and white storyboard animatics for three scenes in the movie. The animatics are accompanied by music, dialogue, and some isolated incomplete effects. Though not the most thrilling supplement, animation buffs might find something to like here. Beyond 'Batman Beyond' (SD, 12 min) - A behind the scenes featurette including interviews with the writers, producers, animators, voice talent, and composer. Topics touched upon include the dialogue recording process, conceptualizing the score, making the film's music video, and some background on the original TV show. Though there are some interesting bits here, this is mostly fluff and far too short to really offer anything worthwhile. Animated Character Bios (SD, 5 min) - Character biographies for Bruce Wayne, the Dee-Dee twins, the Joker, Terry McGinnis, and Woof. Yes, Woof. So all those diehard Woof fans craving some more background information and trivia on the ever elusive half man half hyena can rest easy, Warner Bros. hasn't let you down. Confidential Bat Footage - For Your Eyes Only (SD, 5 min) - This is black and white storyboard animatic footage of two deleted scenes from the movie, complete with recorded dialogue. Cut due to pacing concerns, there are some interesting moments toward the end of the second scene featuring Bruce Wayne visiting an abandoned Arkham Asylum. Mephisto Odyssey 'Crash' Music Video Featuring Static X (SD, 4 min) - The music video for the song 'Crash' written for the movie and performed by Mephisto Odyssey and Static X. Young Justice Trailer - A trailer for the new Cartoon Network animated series 'Young Justice' provided in 1080p and stereo sound. 'Batman Beyond: Return of the Joker' is a worthy addition to the DC animated universe. Though not perfect, it does provide some nice entertainment and handles the iconic characters with respect and creativity. The video and audio presentations are strong but most of the extras are a bit disposable. 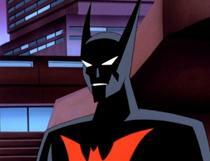 Even so, 'Batman Beyond' fans should be pleased.